And it’s up – the long awaited News International paywall for the new Times and Sunday Times websites has gone up today. 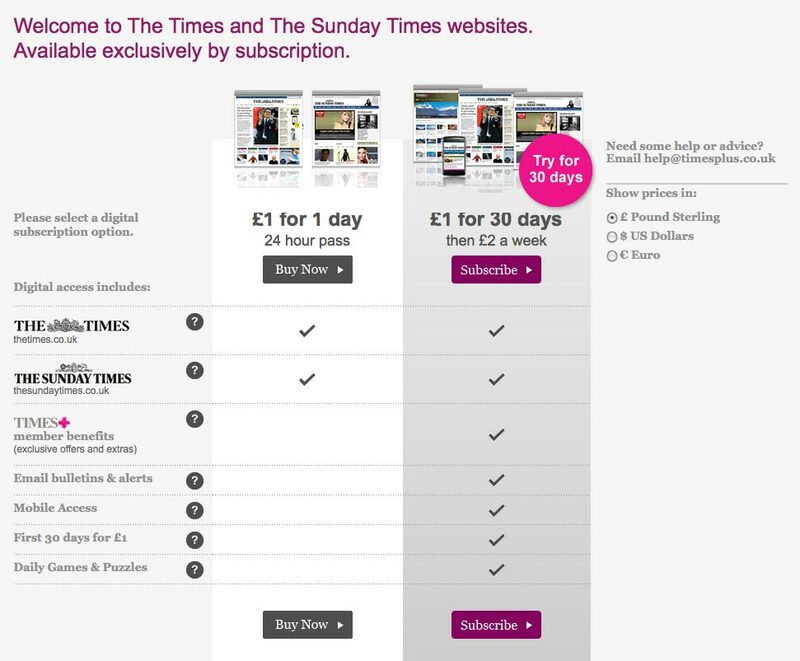 This is the screen you get when you try to go beyond the sites’ homepages – thetimes.co.uk and sundaytimes.co.uk. It’s interesting to see what’s not included in the £1 day pass option: email bulletins, mobile access and daily puzzles. And The Beta Blog looks at paywalls and “game theory”. This entry was posted in Business and tagged News International, Newspapers, paid content, pay wall, paywall, paywalls, the Sunday Times, The Times, times on July 2, 2010 by Laura Oliver. It’s going to happen between now and eternity, but for Pete’s sake can’t you newspapers cooperate at least on something important like this? Or is this day 1 of a whole week of paywall-risin’? Still, I’d like to have some paper in my hand once a week, just for waking up lazy. How about a nice weekly opinionated summary in a Sunday paper? I thought the concept of paywalls had more to do with propping up expensive printing and logistics operations than paying for quality journalism.